Lately I've been obsessing about learning how to draw. I used to think it was something people are born with, like a high school friend of mine who spent all his time reading comics and drawing superheroes, or a university friend who could do detailed drawings of anything architectural. Now I think their natural talents, though considerable, were mainly brought to excellence because of observational skills, and a lot of practise (much like knitting?) 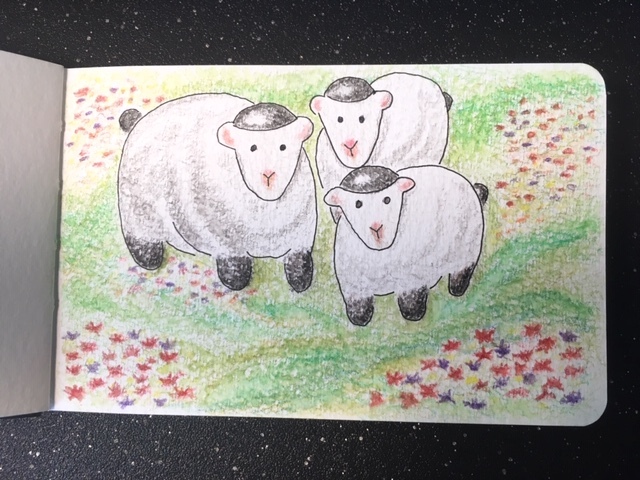 I have come to suspect that if I am willing to settle for 'appealing in some way' as opposed to 'so realistic people will think it's a photograph', I might be able to draw too... which is how I got these sheep. You might recognize the sheep. You might, in fact, have the same sheep tape measure I do in your knitting bag. Today I followed up by drawing spoons, but they aren't done yet so I'll spare you that. The connecting factor between them is going to be Faber-Castell Polychromos pencilcrayons which I'm hoping will allow me to more colourful drawings than I am getting with the Faber-Castell Watercolor Pencilcrayons I used for the sheep. My plan for those was to draw the outlines with a waterproof Micron fine-tip pen, then colour them in with the watercolour pencils, then soften all the colours with a fine wet paintbrush, then go over top with the pencilcrayons when they finally arrive from the shop where I ordered them. Because going over and over the same drawing is the best way to get past having very few ideas for pictures. I find it ironic that the colours look more washed out without water, than with! When I've gone over it all with the top layers, using much sharper pencils to fill in all the white bits in the paper, this little sheep scene should be downright vibrant... as well as more detailed in the flower department. A girl can hope, anyway. The notebook I used for this is a very small Moleskine watercolour pad. It's not something I needed or would have considered if I were shopping online, but I saw it a few weeks ago in a local art store and it just felt so nice in my hand I couldn't leave it behind. I didn't know if I'd have the courage to put pictures in it because the pages are sewn in and not perforated for tearing out if you don't like them. So far though, I have been using it, drawing something with the Micron pen or with pencil to be coloured in afterward, or improvising a scene in watercolour paint. It's been a good test of character, I think, risking imperfection like that in such a nice book, and such a good boost to my sense of artistic self to find that I enjoy flipping through the pages to look at what I've made so far. No cringing yet. However, it's also been a learning experience, because the Moleskine paper is super textured and not really ideal for pencil sketches. I think after I've finished the spoon series, I'll focus more on watercolour paints for it and maybe even get a second book for sketching. In other news: while I've been distracted by pencils and paintbrushes, my socks have been WEARING OUT! Actual holes in the toes and heels... I never thought the day would come, my socks have served me so well for so long. And here I am with another half-dozen pairs waiting for their ends to be run in so I can put them into the rotation, waiting at the door for pencilcrayons instead of getting the job done... I guess I know what I'm doing this weekend. Hope all is well with you and that there are no holes in your socks!